Right now, our friends at Every Voice are running a “Fix Our Democracy Now” week of action, and we’re proud to be a participating organization. Every Voice is pushing for elected officials to pass legislation that would reform campaign finance law, protect voting rights, and end partisan gerrymandering. We’re excited to support these reforms because our government will only be truly democratic when everyone can run for office regardless of their economic background, vote without having to jump through discriminatory hoops, and know they are fairly represented. We know this because we’ve been fighting the corrupting influence of big money in politics ever since our founding in 2004. We started building grassroots fundraising software way back then because we saw there was a huge barrier to entry for people who wanted to get involved with the political process: both potential candidates and supporters felt like they couldn’t make a difference if they didn’t have millions of dollars to burn. This prevented diverse, smart people with good ideas from running for office and left room for candidates controlled by mega-donors to cruise to victory. And especially after Citizens United, conservative mega-donors like the Koch brothers not only bankroll entire campaigns but also pay for dark money groups that lobby for voter ID laws and fund court cases that contest district lines. Luckily, thousands of groups have now realized how small-dollar contributions fuel widespread civic engagement. When people can easily chip in $5 or $10 to a candidate or cause, they become invested in the outcome and are more likely to volunteer, ask friends and family to donate, and give again themselves. And the conversations these donations spark are what get more people to the polls. We even hear from donors that being able to give a few dollars online is sometimes the only way they can support a cause. This is how small-dollar donations add up to democratic people power that conservative mega-donors can’t beat. What’s more, we’re seeing an unprecedented amount of participation across ActBlue right now. Since Trump’s election, more and more folks have realized the power of grassroots donations and are donating for the first time, fundraising for their favorite candidates, or choosing to run for office with the support of their own small-dollar donors instead of big money. More than a quarter of all people who gave via ActBlue in Q2 2018 were first-time donors, and grassroots donors have raised nearly $1 BILLION using our platform so far this election cycle. It’s clear Americans are more engaged in our democracy than ever before and want the playing field to be leveled — now. These reforms couldn’t come at a more important time for our country. The Koch brothers are spending $400 million on the midterms, Sheldon and Miriam Adelson recently gave $30 million to a GOP super PAC, and the list goes on. That’s why everyone who believes in our democracy needs to fight for reform now. Small-dollar donors are countering the impact of these mega-donors by raising more money, talking to their communities, and turning out voters, but we need to get Democrats elected so they can enact reforms before Trump and his enablers do more damage. Momentum is on our side right now, but we’re going to have to put in a lot more work before Election Day. To learn how you can take action to Fix Our Democracy Now, visit www.fixdemocracynow.com. And if you’re interested in fundraising for your favorite campaign, reach out to us at info@actblue.com for help getting started! Last night, Ted Cruz mentioned us in a debate about the tax code on CNN with Bernie Sanders. Perhaps not surprisingly, Cruz got his facts wrong. When talking about big money in politics, he compared us to the Koch brothers — some of the biggest Republican mega-donors in the business. As a nonprofit fundraising platform for the left dedicated to helping small-dollar donors speak truth to power, we were caught off guard by his mistake — and so were the people in our community. Better luck next time, Ted. In the meantime, we’ll be actively empowering small-dollar donors so they can fuel the organizations and causes they care about and power Democrats to victory in 2018, 2020, and beyond. When the House GOP voted to repeal the ACA, they jeopardized the health and security of millions of Americans. In many cases, the Republicans who voted for Trumpcare don’t have a challenger yet, or have several primary candidates going up against them. But when the results came in, small-dollar donors were clamoring to take action and do whatever they could to fight back and defeat them in 2018. We heard them loud and clear and quickly came up with a powerful solution to help them amplify their voices. Our team was all hands on deck on the day of the Trumpcare vote, working to get nominee funds set up for every congressional district that had a Republican incumbent. 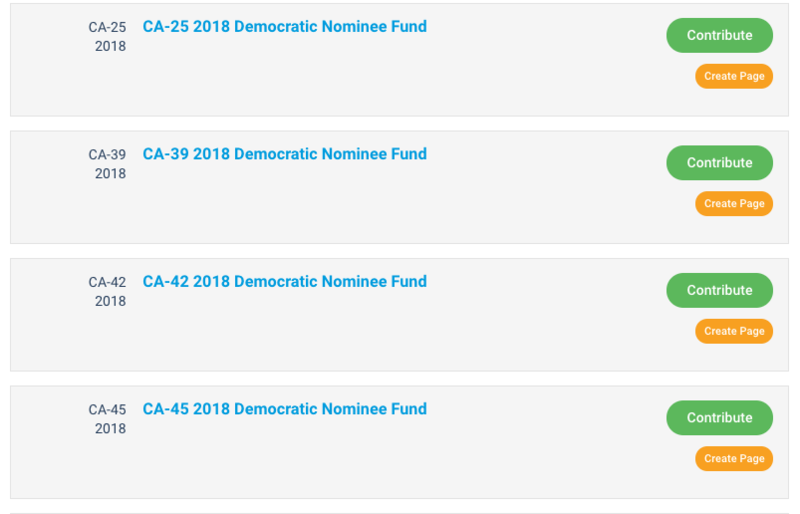 Nominee funds are a tool from back in the early days of ActBlue, and they allow people to donate to the eventual Democratic challenger in a district. That means that once the primary is over, the Democratic nominee will receive all of the money raised into the fund. In the meantime, we’ll hold the money being raised in escrow. After the primaries, we’ll get the funds out to the Democratic nominee within 10 days of the results. We created a single contribution form listing all of the nominee funds in response to interest on Twitter, and helped groups like Daily Kos and Swing Left create similar forms with specific slates of vulnerable districts. All together, these nominee fund pages raised more than $2 million in under 24 hours. Contributing to nominee funds allowed supporters to channel some of their anger, and those donors helped bring our sitewide total for the day up to $4.2 million. 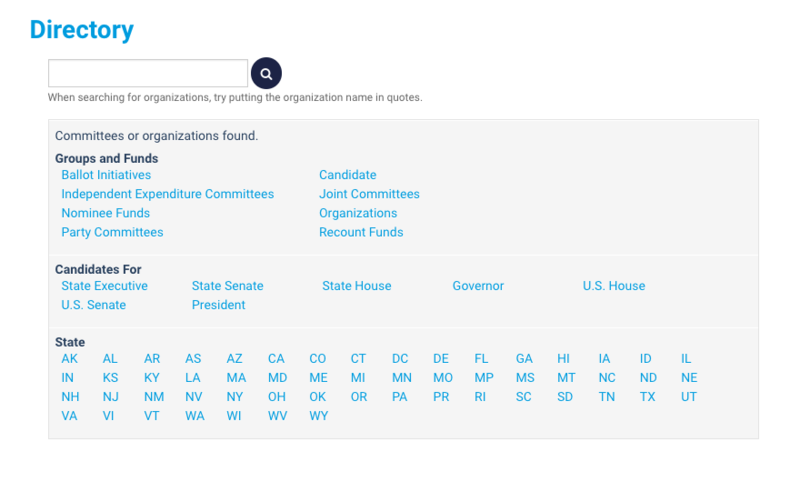 There’s a lot of work to be done to help Democrats set our country back on the right path, so starting today, you can create your own fundraising page with all the nominee funds you’d like to support — including Senate campaigns — and organize your own network. And you can find a page that includes all Senate seats with a Republican incumbent here, for you to share as you’d like. This is just one more way that we can put power into the hands of small-dollar donors, and help concerned citizens like you have an impact on the future of our country. 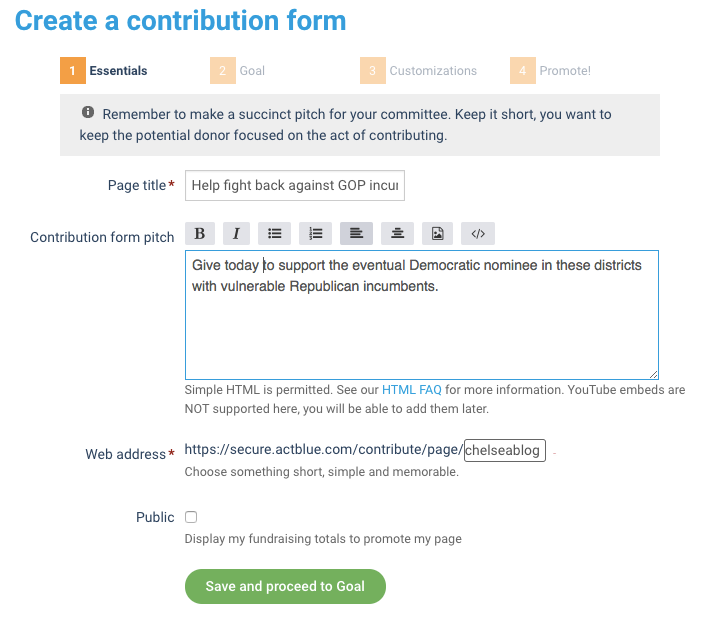 How can you create your own page to raise money for Democratic nominee funds? To create a fundraising page with nominee funds, you’ll want to head to our directory. First, select “Nominee Funds” under “Groups and Funds.” This will bring up the master list of active nominee funds. Then, you can choose a state. Just click the orange “Create page” button to get started. You’ll be prompted to sign in or create an account, so you can come back and make edits to the page after it’s created, as well as track the page’s performance. Next, you’ll be asked to fill in some basic information, like a page title and a pitch to supporters. You can also add a goal thermometer so your supporters can see how much your form has raised. 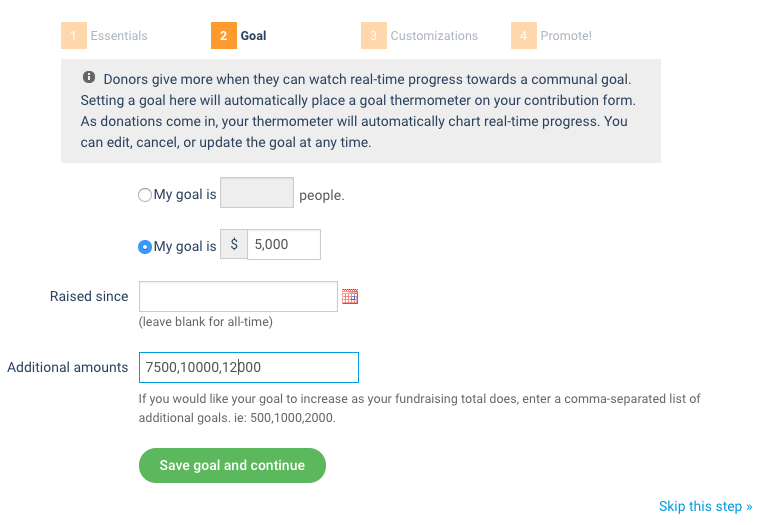 If you include a goal, a thermometer will automatically be added to your contribution form, like the one below. We recommend choosing amounts that are reasonable and that donors feel like they can help you reach. You should also include a couple of different amounts so that if one goal is reached, the thermometer will automatically update to show the next highest goal you’ve chosen. If you want, you can also skip that step in the bottom right corner and make these customizations at a later time. 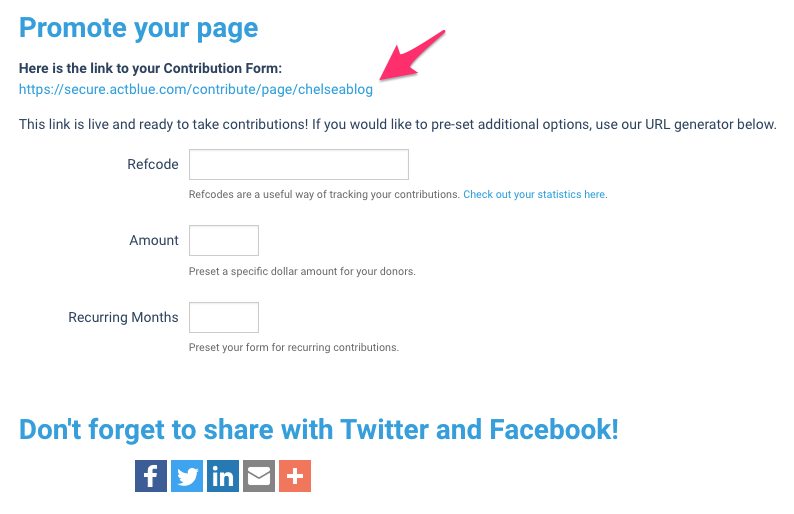 On the next page, you’ll select your preset contribution amounts, which will determine which buttons are available on the form. 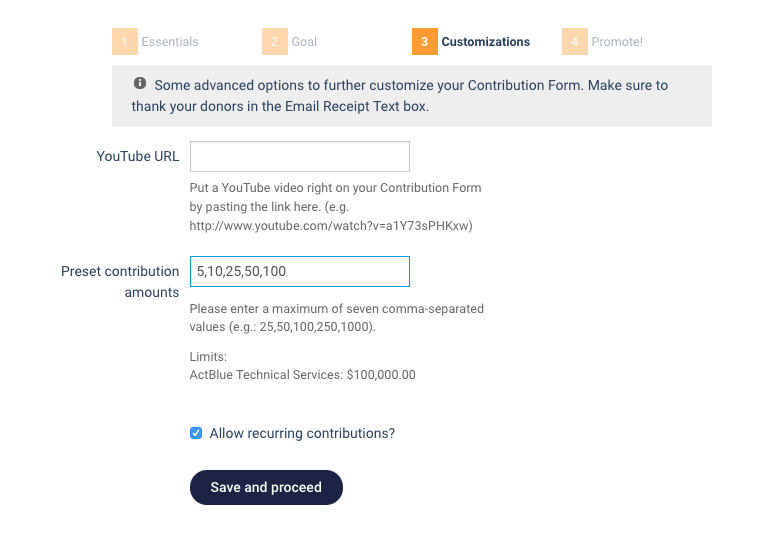 Of course, your donors can always type in a custom amount. You should also choose whether or not your form will be able to accept recurring contributions. Once you’ve finished customizing your form, you’ll be brought to the Promote page, where you’ll be given a link to share with your network, as well as options to share the form on Facebook and Twitter. To find out more about social share, click here. If you want to add more nominee funds or candidates to your page so you can raise for a group of funds at once, head over to the Add tab of your form. Search for the group you want to fundraise for just like you did in the Directory, and click “Add” to add it to your page. After you’ve finished adding groups to your form, you’re ready to start spreading the word and raising some money! You can post your link on social media, or email it out to your friends and family and encourage them to share it with their own networks. If you’re going to be posting your link in many different places, we recommend using refcodes to keep track of where your donations are coming from. For example, with refcodes you can easily see if a supporter made their donation from Facebook, Twitter, or an email you sent out. To read more about refcodes, click here. When you want to check in and see how fundraising is going, you can head to the Statistics tab of your form to see a breakdown of all the contributions you’ve brought in so far. We hope you’ll find these nominee funds helpful in organizing folks in your communities and taking part in the resistance movement during this critical time. And as always, you can find us at info@actblue.com to answer any questions. 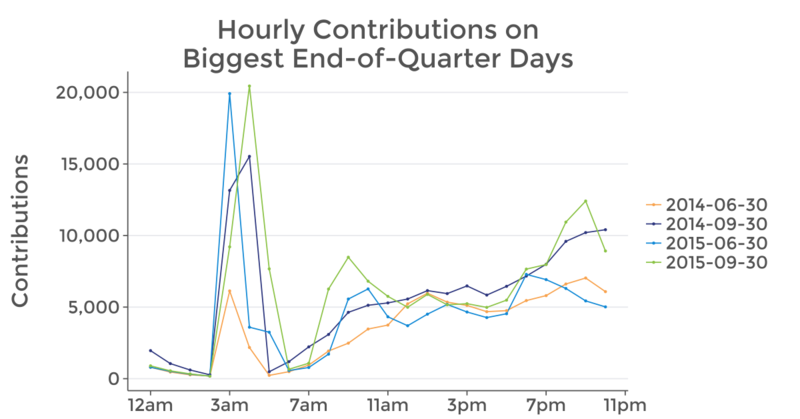 Q3: The most donors in a day, ever. As you read this, keep reminding yourself that we’re talking about the third quarter of an off-year. An off-year! We broke the record for most contributions in a single day: 147k on September 30th. It was also our second biggest day ever in terms of money raised, a total of $5.5M. What’s #1 all time? Well, that was September 30, 2014, in the run-up to the mid-terms. Here’s how we got there: We started off the morning strong with a peak of 400 contributions a minute (a new record) when we ran recurring contributions as a batch while everyone was sleeping. Later in the evening we were flying at 250 contributions per minute — all new, organic contributions (also a record). In moments like these, infrastructure matters. Our engineers have been working for years to increase the volume we can handle per minute and everything ran as smooth as butter (or your favorite non-dairy substitute). Meanwhile, people are no longer chained to their laptops — mobile giving was a powerful force this past quarter, especially in the evening hours, when people are more likely to be checking email on their phones. 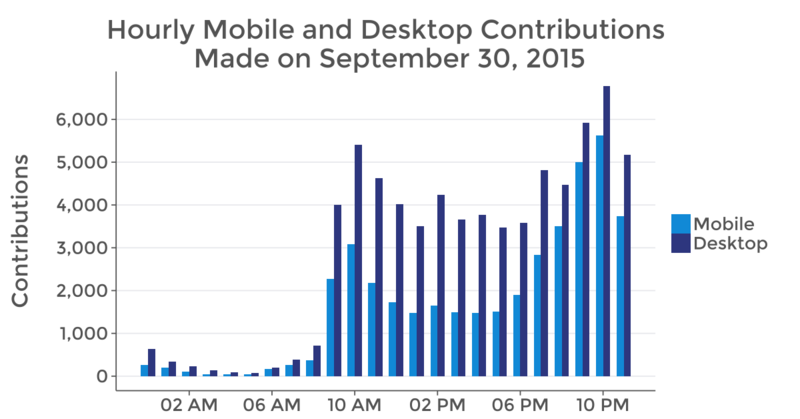 Between 9 and 10 PM on September 30, we saw mobile contributions spike to an unbelievable 50% at one point (another new record) and finish at an average of 44.3% for the hour. That figure — 44.3% mobile contributions in an hour —is unheard of in this space. For a little context, just two years ago our mobile average was just 15.5% for the month. This leap was only possible because our tech team has focused on improving mobile conversion rates with notable features like Express Pass and Express Lane and on constant, small iterative changes to our contribution form that make it load faster. There is no way that we would have broken so many records without thousands of hours of developer time going into mobile optimization and sheer processing infrastructure. The chart below details the pace of the day compared to the other top EOQ days. We know fundraising picks up later in the day, so we process all of the scheduled recurring contributions early in the morning (note the massive number of contributions that start in the 4AM hour). And it’s not all just west coasters giving in the last few hours. It’s folks checking their email on their phones before bed, reading an urgent appeal, and responding. And it’s a beautiful sight to see, for those of us who care about our democracy being for and by the people — not just those who can cut checks for thousands (or millions) of dollars. If current trends hold, ActBlue could process half a billion dollars in small-dollar contributions this cycle. Well…it’s been nine months and we’re already well past the $130M mark. It’s fair to say we’re well on our way to hitting that target. And $56M of that money came in this quarter alone (scroll down to see how this quarter compares to previous years). Campaigns, organizations, and committees are coming out in full force this year. So far this cycle, almost three thousand different campaigns and committees have raised money using ActBlue. It’s all a sharp contrast to the massive checks the Republican super PACs have been cashing. The bigger the pool of active, engaged donors, the stronger the party. That’s why we place such a strong value on our whopping 1.7 million Express users, who have saved their payment information with ActBlue. What’s important is not just the sheer size, but how recent and active these donors are. 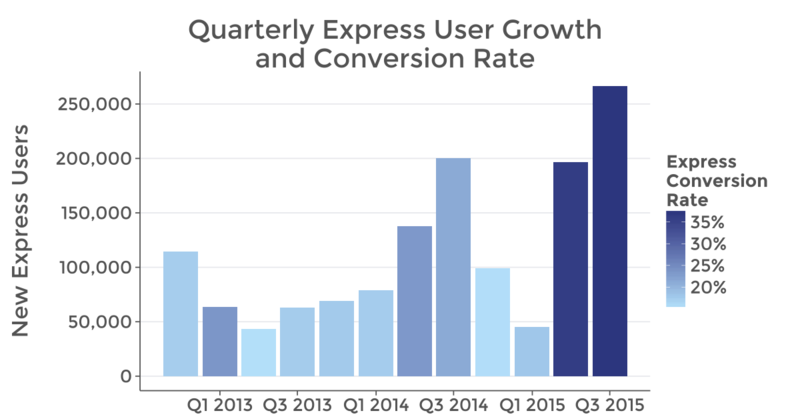 We’ve added more Express users (267k) this quarter than in any other. And we added an incredible 24k on EOQ day alone (new record)! One reason why that’s the case: high Express conversion rates. This past month, 38% of donors eligible for an Express account signed up for one. Last cycle, we were averaging just over 20%. It’s an indication that more and more new donors are coming in and immediately thinking ahead to their next donations. That’s a huge strength for the party right now. “Small[-dollar] donors are becoming the backbone of Democratic giving.” And the Republicans have nothing like it. The chart below shows both the number of new Express sign-ups and the rate at which non-Express donors are signing up as Express users over the past 12 quarters. Below we break down this quarter compared to previous quarters. Some interesting nuggets from this data: We processed more than double the dollar amount we saw in our last off-year, Q3 of 2013. And there was an even bigger growth in the number of contributions from two years ago. We jumped up from 637,924 to a massive 1,643,083 contributions this quarter. That’s a 259% increase. Recurring contributions remain the best way to sustain a campaign or organization in the long-term. And we’re continuing to see huge strides forward with recurring. On the morning of September 30th, we processed our biggest recurring haul ever: about $700k in recurring donations, from 37k contributions. Look at the huge jump in the overall recurring numbers for the quarter. A full 23.9% of all the money that came in this quarter was from recurring contributions. That’s phenomenal! This doesn’t all just happen. We’ve spent a lot of time extolling the virtues of a strong recurring program and helping campaigns and organizations increase their conversion rates. At the same time, Americans are starting to get more comfortable with giving monthly. Recurring is a huge percentage of the money raised by international NGOs. They’ll spend up to $175 on acquisition per person, because of the lifetime expected value of a recurring contribution. Campaigns don’t value recurring contributions quite that highly yet, but it’s exciting to see the tide turning. It’ll lead to much more stability for campaigns and organizations. And they’ll be able to focus more on core work beyond fundraising. Plus, donors love being able to easily give on a regular basis to the candidates and organizations they care about. To all the hardworking digital campaigners out there who made this quarter such a success, congrats! We’re proud to help you fuel your campaigns and organizations. Drop us a line any time if you want to talk strategy, or just have a question: info@actblue.com. Campaign season is picking up quickly as we march on toward 2016, and we’re always working to make things as easy and efficient as possible for our users. That’s why we’ve made some big changes to the way contribution forms are managed — and now it’s better than ever. We’ve made it so you can access your campaign or organization’s forms (with or without money raised) all in one convenient place. 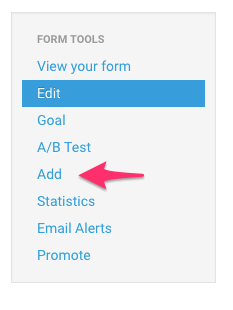 Plus, we’ve got a bunch of other new features to make managing your forms easier than it’s ever been. Just head over to the By Form tab from the left menu on your campaign or organization’s dashboard. Once there, you’ll see a detailed breakdown of all your contribution forms. They’re listed in descending order by default, starting with the most recent form that was created. But just click on any of the headers and you can toggle the table to sort it how you’d like. With this update you’ll be able to simply glance at the table and get a clear picture. You can quickly scan through the slugs (or page names) you gave your forms, the number of contributions they received, the amount of money they raised, and whether or not you chose to brand your forms. You’ll also be able to duplicate a form from this page, with just the click of a button. Further, if you’ve got a form from a few years back that you know won’t be getting sent out to donors, simply hit the Archive button in orange at the right of the table. If you choose to archive a form it can no longer be viewed, which also means it can no longer receive contributions and you won’t be able to edit it. However, we give you the option to archive rather than delete your forms, so that you can Revive a form if you need to. If you’ve archived a form it will turn grey, as you see below, but it will still be listed in the same spot in the Dashboard as it was before it was archived. Just click Revive at the far right of the table and the form will become active. Anyone with access to the Dashboard will have the ability to visit and work with the form again. You’ll also notice that there are two tabs at the top of the page, one for Managed Forms and one for Community Forms. The Managed Forms tab provides a breakdown of forms that were created by any user with access to your campaign or organization’s Dashboard. The Community Forms tab provides a breakdown of forms that were created by a third party. For example, a volunteer decided to create a form to raise money for your candidate or organization. You won’t have the ability to edit these forms, but you can collect data, just like you would from a form created by yourself or another user with access to the Dashboard. Just below those tabs you’ll also have the option to Download a contribution form CSV report. 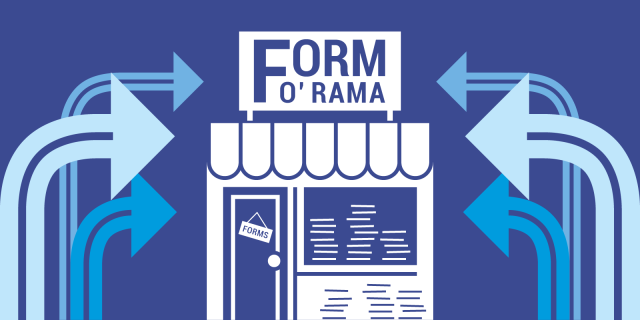 This report will give you an even more detailed breakdown of each form, including info like whether or not the form was set to public or private, as well as the pre-set contribution amounts you chose for the form. Finally, you can now search for a form by page name. Simply type in the name you gave your form in the box at the upper righthand corner of the table. If you have any questions or comments about this update, please don’t hesitate to reach out at info@actblue.com. By far the biggest single source of Cantwell's fundraising last year was ActBlue, a political-action committee that acts as an online conduit for individuals who want to give to Democratic candidates. ActBlue "bundled" $365,000 for Cantwell. Oh, hey scare quotes. If you check out Cantwell's ActBlue hub, you'll see she's received 7,333 donations through ActBlue totaling $750,000. That works out to about $100 a pop. Those donations were made by folks (real people!) who decided they wanted to support Cantwell's campaign and the money was disclosed to the FEC. So, we've got lots of people choosing to participate in a campaign, and doing so transparently. Terrifying. Let's return to those scare quotes. The author of the piece uses them to imply something inappropriate about small-dollar fundraising, as if totaling up grassroots donations were somehow the equivalent of, say, the K Street Project. It's ridiculous. Enabling small dollar donors to participate transparently and consequentially in the fundraising process only enhances democratic accountability. It's the opposite of the shadowy system of billionaire-financed campaigning that's kept the Republican nomination process going for so long. Bundling our "bundling" in with that sort of fundraising reflects a profound ignorance of what ActBlue actually does, and damages the credibility of the piece as a whole. It also reflects a real blindness about the role of money in politics. Money that comes from individuals and is disclosed in a way voters and reporters can access is hardly a corrupting influence. 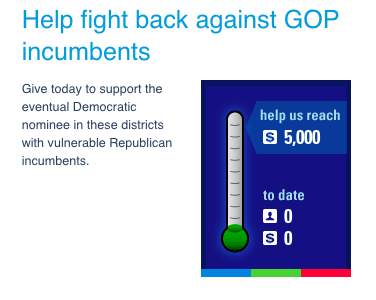 It's just another way for (actual) people to express themselves within the political process; the fact that ~$100 individual donations through ActBlue account for the lion's share of Maria Cantwell's fundraising is something to be celebrated, not scorned. A few weeks ago, Nick Confessore of the New York Times wrote a piece about the reluctance of small donors to return to the Obama fold. Shira Toeplitz of Roll Call recently examined the slowdown in traditional fundraising: major bundlers and PACs. For Confessore, the fact that President Obama has to work harder for small donors stems from his sagging popularity. For Toeplitz, it's a sign of the down economy that the deep-pocketed can't dole out the sort of financial largesse they used to. Both of these theses have some real problems. Confessore runs into the problem that conventional methods of reportage are a terrible fit for assessing as broad a category as grassroots donors. Dozens of interviews are a poor way to figure out what's going on in a population that numbers in the millions. Some people are undoubtedly disappointed in President Obama, but many more may not have tuned into the process yet. In 2007, Democrats were where Republicans are today: focused on a contested primary process to replace a President that was wildly unpopular with their base. It's no surprise that it's harder to engage the Democratic grassroots now; whether that will remain the case is anybody's guess. Finally, it's not as if the President has some special claim to these donors–they're a political constituency like any other. Even if there were reason to accept Confessore's thesis without question, we should be celebrating the fact that political actors have to work for their support, rather than ignoring it as irrelevant or taking it for granted. Today, there are lines of accountability and financial interdependence between legislators and grassroots donors that didn't exist ten years ago, and that's a good thing. The Toeplitz piece is a bit harder to find bright spots in, as it takes the same basic error and adds a laundry-list of excuses for a poor fundraising quarter. Hurricane Irene, the debt ceiling melee, the (crippling!) impact of the economy on our nation's wealthiest donors, and even the Jewish New Year all come in for blame for the lower-than-average haul, as if that were the important aspect of those events. '09: $9,368,191 from 105,266 donors to 1,160 committees. '11: $10,230,421 from 199,595 donors to 1,388 committees. Hardly the declines we'd expect to see if Confessore and Toeplitz are right. Grassroots donors are more engaged in the fundraising process than ever before. Even if the sources Toeplitz quotes are right, it may not be the case that fundraising has declined, rather that its character and the methods used to go it are changing and the political sector is lagging a bit in recognizing that trend. As political fundraising becomes increasingly digital and grassroots, the value of traditional methods may lose a little of their centrality. (They'll still be important!) That's not a bad thing–it will create a political system that's more dynamic and has fewer barriers to entry. There will be more voices and more choices for voters to listen to and weigh, and that's the essence of representative democracy. On Wednesday, the Washington Post broke the news that the American Action Network, a Republican "charitable organization" along the lines of American Crossroads GPS, was financed entirely by 11 checks, with 82% of its funding coming from just three donors. AAN and Crossroads GPS are not required to disclose donor information and can protect donors from any blowback that might result from their decision to influence the political process or the specific ways in which AAN/Crossroads GPS employ their money to accomplish that goal. As a result, donors get to have their cake and eat it too: they're largely invisible to the American voter, but highly influential within the small community of policymakers that make legislative decisions. It's an appealing proposition. There are a number of significant downsides to this arrangement, however. Before I get into them, I'd like to be clear: there's no problem with giving money to political candidates. There's no problem with giving a lot of money to political candidates. There is a problem with giving undisclosed money to political candidates. At the most basic level, disclosure is a mental shortcut for voters. It's a way for them to consider the source, to divine what interests believe supporting this candidate is in their interest. If that information isn't available, it undermines democratic accountability. If voters can't get access to any information about who is backing whom, their role in the political process becomes little more than a patina of consent on top of a structure they are prevented from informing themselves about. So you have a situation in which, over the long term, rational actors are undermining the very system they depend on. Politicians need to finance their campaigns and want to outraise their opponents. Their donors want to insulate themselves from the consequences of their speech. The tragic irony is that in doing so, they are sawing the foundations of a functioning democracy–information and accountability–out from underneath themselves. Left to its own devices, the emerging situation becomes a race to the bottom: who can raise the most money while revealing the least information about its source. It's not hard to see how that worsens what Prof. Larry Lessig calls "institutional corruption," and ultimately paralyzes our government. That's why what we do here at ActBlue is so important. Our platform gives small donors a stake in the process and enables them to make themselves felt in major races, while also preserving the transparency that's key to a stable democracy. That transparency, in turn, lets donors assess the impact of their donations in aggregate, which makes them more likely to give again. In short, our virtuous cycle counteracts the vicious cycle kickstarted by Citizens United. it can be pretty frustrating watching these solutions get tripped up in the bureaucratic thicket of the FEC, or the closed ecosystem of the wireless carriers — with all the architectural limits they carry that the free Internet does not. He argues that the point-of-sale constraint of Square, SMS payment limits, and FEC disclosure requirements are the major obstacles to mobile giving. Here's the problem: simplicity and ease of use are important, but the real limit Ruffini is bumping up against–by his own admission–is the lack of scalable infrastructure on the right. That lack forces Ruffini into awkward spaces, like calling for mobile operating systems to update their OS, or the creation of new apps to facilitate political giving. It's not that these are impossible, or not worth doing, but that their value is unknown relative to the costs they impose on developers and carriers. Fortunately, over here we've got that problem solved. Want to collect donations in real time? Text or email your audience with a link to an ActBlue page. And, unlike asking people to download apps, collecting email/phone information at political events is pretty commonplace, as are email solicitations. Checking mail is a core functionality of almost any mobile data device, be it smartphone, iPad or laptop. Devices will proliferate, change and converge, but email will almost certainly remain. The ubiquitous nature of email means people don't have to leave their comfort zone to give, provided you offer them a simple way to do so. And, because we've already borne the costs and seen the results of our innovation, we're in a better position to negotiate the sort of partnerships that Ruffini outlines. In short, ActBlue didn't need to build, "something that can create a reality distortion field" (Orwellian!) to produce $174+ million for Democrats. We took a means that already existed (email/websites) and made it easy for people to apply it to a new space (political fundraising), while building in the flexibility that would allow it to grow and improve with changing circumstances (not easy!). As a result, ActBlue is now both an invaluable source of funds and a giant proving ground for candidates and best fundraising practices. Finally, an insidery point: Ruffini is a consultant who necessarily makes his living by selling his insights and strategies. ActBlue is something fundamentally different. Because we're a political nonprofit that makes our tools available for free to all Democrats, we're creating of economies of scale that don't exist on the right. When we innovate, thousands of Democratic campaigns, consultants and committees benefit, and they don't have to pay a cent. I imagine Ruffini's innovations carry a far higher pricetag–man's got to eat–which hinders their adoption.